Crayfish live in freshwater ecosystems like lakes and rivers: image via anglinglines.com/A team of biologists from the University of Florida, Tulane University, and the University of Colorado have found that the persistent frog fungus, Batrachochytrium dendobatidis, is not only killing off the world's frog populations, but is infecting and killing off crayfish as well. The group learned new information about the fungus that furthers the understanding of how it spreads, potentially making it a danger for other freshwater dwellers. First, the team found that the B. dendrobatidis lingered in amphibian waters, even after it had killed all the amphibians in a particular ecosystem. It tested crayfish and zebrafish for the fungus and found that zebrafish in the ecosystem were not infected, but that zoosporangia of the fungus was present in the gastrointestinal tracts of crayfish. The team found that crayfish were not only subject to B dendrobatidis infections but that they transmitted the fungus to amphibians in their waters. 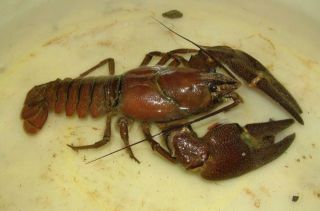 Even if they were not infected by the fungus, the crayfish can act as hosts for B. dendrobatitis, perhtps releasing a chemical that can cause pathology in other hosts. Researchers conclude that finding this chemical "might provide hope for imperiled amphibians." The full journal article, Chytrid fungus Batrachochytriumdendrobatidis has nonamphibian hosts and releases chemicals that cause pathology in the absence of infection, appears in the early edition of PNAS.